← Rule # 97: NEVER live in Florida! Life is Hard, I say that a lot in this blog. But one of the gifts God gives us to make life a little less hard is the companionship of animals. In our family that companionship has come from Dogs. It is one reason this blog is named 2catule, the Hills have always been Dog people. Not that there is anything wrong with being a Cat person, ok to be honest there is but I will leave it as we are just Dog People. There are all types of Dogs in the world. Some hyper and friendly like Piper ( our other lab), some nervous and scared, and some lazy and still others cool. Generally the Dogs are more a reflection of the families they become part of rather than any inbreed trait. The dogs reflect how they are treated by their owners and become the animal their lives lead them to become. Occasionally, there is a special Dog. One that changes you more than you change her. Nittany was that type of Dog. From the moment we picked her up from a breeder near her name sake Nittany Mountain, she was kind and loving. She filled a gap in our family, and helped bring kids from both Bobbi’s and my first marriages into a common love of truly special dog. She was the consistency that gave our entire family a common place to love. She helped us truly become a family. Andrew was 17 and getting ready for college, Collin was 9 and just finding who he was, when she entered out lives…but we all experience the joy of Nittany. a dog that made you love her by her sweet personality. No matter what happened Nittany was a consistent source of comfort and love for our family. 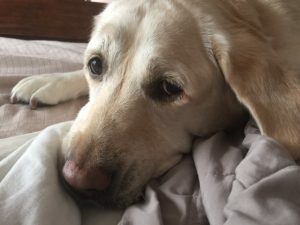 She was in the bed of someone who was sick, or there to wag her tail and lay her head on your lap if you failed a test or were teased in school. She never judged, and never wavered from her consistent loving devotion of our family. She had the ability to seek out the family member that needed her most and stay close to them. She has an emotional radar to be there when you need her, and to give you space when you needed time for yourself. We all learned a lot from her on how to give emotional support to one another. When we first got Nittany Bobbi’s plan was to have her live mainly in the garage, which shifted to included the kitchen and dining room within a week, and our bedrooms soon after. That was Nittany, she had her own plan and by her simple loving nature seemed to find a way throughout our hearts and home. Each of the 7 AuPairs that lived with while we had Nittany in our lives tried to smuggle her to their home countries at one time or another. Even after we brought home our rescue 5 years ago, Piper, Nittany remained the lead dog at the house. As Matthew put it tonight I may have a 2cat rule, but our home was always a 1Dogrule house- and Nittany set the rule. Piper is special in her own way, and has twice the energy that Nittany had even as a puppy. But she is lost today as we all are, looking for Nittany to lead the way to the beds or food bowl. Nittany’s last year was a hard one. She developed complications from diabetes which required insulin and eventually lead to her complete blindness. I am convinced she did this when I developed LADA diabetes so I would be alone in my insulin dependency. We did not realize how blind she had become until we moved to Florida and began to walk straight into the pool. Never a complainer as she went slowly blind she memorized our old house and hid her special needs. Even when facing a new dark house she learned the turns and steps quickly, and would wait by the elevator every morning and night for a quick ride to her bed or food bowl. This old blind dog rolled with the punches that our move and busy lives gave her and remained her cheerful, tail wagging self to her last breath. Piper has the tendency to run away when ever an open door presents itself. We quickly learned that when she ran if we took Nittany on a leash she would lead us to her. She always knew where our family was, blind and old, she could see better than all of us. She knew her family and always knew how to find us. Nittany’s changed our hearts, our lives and our family and will always remain an important part of who we are. She taught us to comfort, to love and to find each other. She will be missed, but always be with us. She truly was a Good Dog.